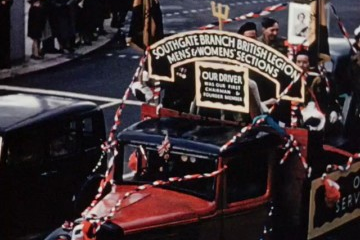 Description: The film opens with "The following record of the local Coronation celebrations has been made as a joint enterprise by the Professional and Amateur Film Producers of Southgate", followed by the title: "Southgate celebrates the Coronation of Queen Elizabeth II" and the production credits. The narrator tells us that it is Sunday May 31st 1953 and we see five flagpoles with flags of the Commonwealth in a park setting with Christ Church in the background. Now we are outside the church as the mayor and other dignitaries exit a ceremony to mark the new municipal year. The mayor is Alderman Charles Ridley. We see the lake and Broomfield Park where a large crowd is gathered to see the mayor. An open air service is held by Reverend Charles Plummer, Vicar of Christ Church. The large crowd, including a large group of choir boys in white cassocks, are singing hymns followed by the sermon. Everyone is smartly dressed; the women wear hats and dress suits. We then see Southgate Town Hall, a large Victorian brick building, with a Union Jack flying outside and a large picture of the Queen on the building's front. Five flags (including the Union Jack, Australia and India fly on the green at Winchmore Hill. We see more flags and bunting in other parts of Southgate, including Southgate Circus. Posters and newspapers advertise the events and celebrations, many of which are to be held in Broomfield Park, where flower arrangements have been set up for the occasion. Shop fronts, including The Arcade, have also been heavily decorated with flags and bunting. A tent in Broomfield Park has been set up so that those who do not have television at home can watch the Coronation. In the evening, a large Grand Carnival Procession organised by the Southgate Chamber of Commerce is held. A marching band goes down the street and the Green Dragon pub can be seen in the background. The parade goes along Green Lanes towards Palmers Green. Crowds have come out to watch in spite of the cold, to see the patriotically decorated floats. A mounted cowboy is followed by a cart full of chlidren dressed as cowboys. The vehicles turn from Alderman's Hill into Lakeside Road. There are many children, as well as Constance Donnelly, "Southgate's own Coronation Queen." The procession, including a large stagecoach, reaches Broomfield Park, where athletic games are taking place. The cowboy judges the children's cowboy and Indian costumes. The mayor presents prizes for the best-decorated vehicles. The queen's 9 o'clock speech is broadcast over loud speakers in the park, but due to the rain, many people have gone home to listen via radio. We see various shots of people in their living rooms as we hear the queen's coronation speech. Shot of a silver 1950's radio. People in their homes include a woman with a pearl necklace, red lipstick and pin curls; a man in a suit and tie smoking, and a mother with a child. Coronation day now ends, but there are various events taking place during the week, as we see from a shot of the programme (and are told by the narrator). Back in Broomfield Park, a huge crowd of children rushes into the middle of the park for the start of the play 'The Three Elizabeths.' The first part of the play depicts Elizabeth Woody, consort to Edward IV. The players have astonishingly elaborate medieval costumes. Children then perform a traditional 'Mummer's Play' featuring St. George and the Turkish Knight. Next, the children play round maypoles and wear Tudor costumes. A woman dressed as Queen Elizabeth I rides side saddle on a horse; she is followed by a large entourage of woman in Tudor costume and soldiers, some pulling a cannon. The theme of the final episode is 'work, service and play'; four boys mime working in a factory. The crowds are huge. We now see a pub sign for Ye Olde Cherry Tree (a Taylor Walker pub) and are told that the next event is a tea for Southgate residents over 80. Film opens with title "Long Live Our Queen". Hello. Southgate mayor Charles Ridley who is, according to the description, one of the dignitaries in attendance at the ceremony, was my grandfather.